Casumo has added not one, not two, but three new slot games. And all three slot games are now only available at Casumo. Of course for the time being, because other online casinos will add the games in the future. I will make a short review on each slot below and also add a gameplay video. But of course playing the game yourself is a lot more exiting. 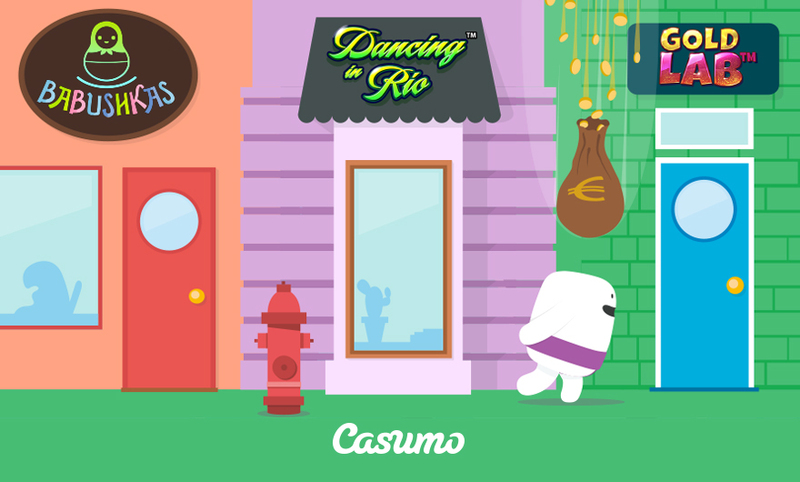 So head on over to Casumo and start playing. A 40 line slot game that you might recognize from land-based casinos. This is the first online slot game by Williams Interactive with a progressive jackpot. And also 5 static jackpots. Win a jackpot if you match the colour of the reels to the attached jackpot. The game also features stacked wilds and stacked symbols. Three or more scatter symbols will award between 10 and 150 free spins, depending on the number on the symbol. During free spins more stacked wilds appear on all reels. A 17 line slot game with a Babushka theme. All normal symbols appear stacked on all reels and a special wild symbol appears on reel 3. This wild symbol will award either the upgrade of the three lowest symbols, all symbols upgrade one symbol or 7 free spins with a wild symbol on each spin. A 25 line slot game with a scientist theme. The game features stacked wild symbols on all reels and special bonus symbols on reels 1, 3 and 5. Getting all three bonus symbols at the same time will turn the corresponding symbols wild and start 4 free spins. During free spins all the corresponding symbols are extra wild symbols. And getting 1 or more other bonus symbol will also make those symbols wild and add another free spin. A total of 4 symbols can become added wild.